Under the low lighting and dramatic backdrop of the Tate Britain’s main gallery, crafters went wild for Etsy at one of the online market’s first UK events. Etsy has been targeting the UK and Irish markets hard this year. Sellers at the Tate Britain on Friday evening commented that most of their sales had been from the US but this was starting to change with more awareness developing in the UK generally. Events like this certainly helps to raise the brand in the minds of shoppers. There were ten sellers at the gallery, all of which have been blogging on the theme of the current Pre-Raphaelite exhibition that is running at the moment. Indeed the stalls were filled with items that might suit a Pre-Raphaelite brother or sister. Draped vintage clothing, tapestry cushions and artwork, Shakespeare-inspired notebooks, silver jewelry, craft kits and prints were among the goods available to shoppers. Trade was pretty brisk too. Patrons were not just looking at the goods, but buying them. Interestingly, though attendees were notified via the Etsy UK event page on Facebook that the market would be a cash-only affair, some sellers were using iZettle, the mobile payment system to make transactions. This is a good sign, as iZettle only arrived in the UK last month. Georgina Blain, who works on UK marketing for Etsy, was beaming when we bumped into her – and rightly so at such a packed event. She noted that both sellers and customers were pleased with the evening and that it was not just the retail side of things that was proving to be popular. Alongside the stalls an Etsy Lab was running where visitors could take a seat to learn how to make Christmas crackers and decorations by hand. The table was filled to capacity and Blain said that it had been so throughout the entire evening. Naturally I couldn’t leave without making a purchase, there was far too much temptation. The hand-crafted nature and high quality of the goods was impressive and the festive timing of course makes it all good for a little light Christmas shopping. The items I chose were carefully hand-wrapped and placed in decorated bags. This is something that makes craft fairs so valuable, the individual touches really sell well in comparison with the regular plastic consumer presentations you are more likely to find on the high street. 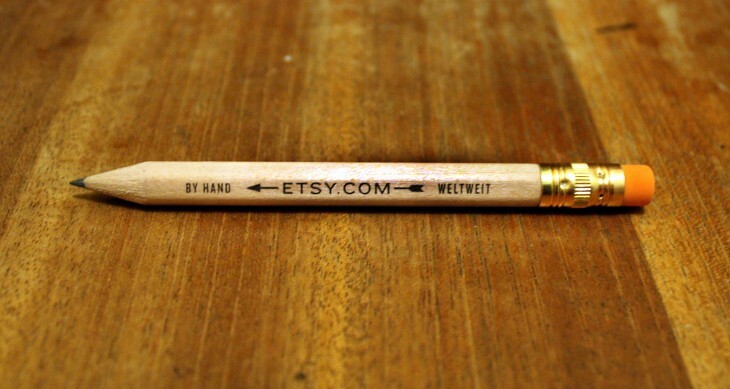 All in all, Etsy had a success on its hands. The combination of Christmas shopping and the general buzz at the event was proving to be a draw for visitors to the exhibitions at the gallery. When asked, Blain said that the success of the evening could lead to more and bigger events in the UK. In actual fact, a bigger version would be very welcome. Having been to a large Etsy market in San Francisco and nearly bankrupted myself, I think there will be a similar appetite in the UK. Just let me apply for a mortgage first.